A BEST-ON-GROUND performance from Shaun Higgins has the classy Western Bulldog primed for a round one AFL return. 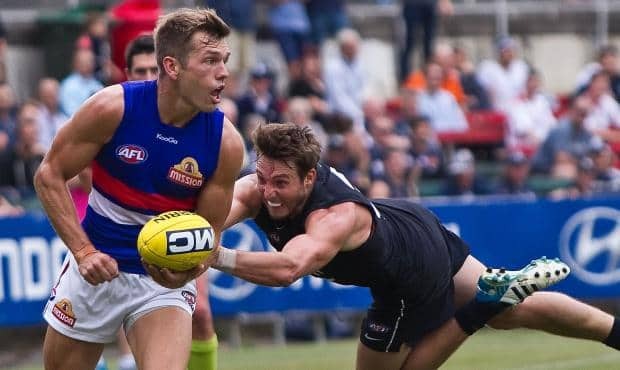 Higgins, who has not played since round three last year due to a navicular fracture in his foot, continued his progress to a comeback with a 33-possession showing for the Dogs in their practice match win over Carlton on Friday at Visy Park. The Bulldogs broke away early in the game with a 32-point lead at quarter-time, with Higgins a key player in their dominance. The Blues hit back with a four-goal-to-one second term before a tighter second half, but the Bulldogs prevailed by 17 points. They won 12.11 (83) to 9.12 (66) in their final competitive hit-out of the pre-season, with the Dogs to hold an intra-club next week ahead of their round one meeting with West Coast on March 23. Higgins admitted he had felt some anxiousness in his first game back from the injury last week against Fremantle, but said the positional switch had helped him settle back in. "The foot's fine," he said post-game. "Last week I had probably a few nerves going into the game in terms of just getting back out there and playing and wondering how you'd go. "But I think the role across half-back has probably helped that a little bit and made me focus on just beating my man and then play from there. "The foot was a long time ago now, I've had a full pre-season of running so I feel as if I've done plenty of work. It's not as if I'm going in a little underdone." That was obvious. He set up the play from half-back and also moved forward to use his damaging possession and poise, with the 26-year-old appearing in strong physical shape. He described 2013 as "as frustrating as you get" but said the progress made by the side had steeled him to get fit and be a part of some success. "You play to win and we've had some reasonably successful sides and I was part of that so I want to get back there as quickly as possible," he said. "Obviously it's not great on the sidelines but it's probably made me a little bit hungry over the pre-season and I'm really enjoying playing with those guys. "I think tonight showed how good some of them are so it's going to be an exciting couple of years I think." The Blues lost Brock McLean in the first term, with the midfielder hobbling off the field and heading to the club's headquarters for medical attention. Although he played no further part in the game, the club said he was fine and had only suffered a knock, and was not going to be risked in the practice match. The Blues expect him to be fit to play against Port Adelaide at Etihad Stadium next Sunday for the Blues' season-opener. Higgins was supported by Brownlow medallist Adam Cooney, who kicked three goals from 21 disposals, including several vintage Cooney moments where he created space and time for himself and delivered the ball with precision. Koby Stevens (20 disposals), Jack Macrae (25 and 10 tackles) and Lin Jong (19) were younger Bulldogs to show encouraging signs. And after sitting out the first half Tom Liberatore had 20 disposals in the second half, including an amazing 16 touches in the third term alone when he controlled the clearances. The Blues started the contest off the pace (the Bulldogs had 52 more disposals in the opening term), but they came into the game in the second quarter and were better thereafter. Second-year forward Troy Menzel, who appears set for a more permanent role in the club's attack this season with his crafty left foot and goal smarts, supplied two majors. Kade Simpson led the Blues with 29 disposals, with Mitch Robinson (17 and two goals), Ed Curnow (23) and Zach Tuohy (18) also solid contributors. New recruit Dale Thomas had 17 disposals but not a significant impact. Carlton will be buoyed by what they saw before the clash with the Dogs, however, with big man Lachie Henderson playing for the Northern Blues against Footscray in the preceding VFL practice match. Henderson, who had leg surgery in January, looked underdone but competed well in attack and is expected to be available for round one after getting through the contest unscathed. The Bulldogs' prized No.4 draft pick from last year, Marcus Bontempelli, also played in the earlier game in his first appearance in his new club colours, and was involved in some creative passages of play.